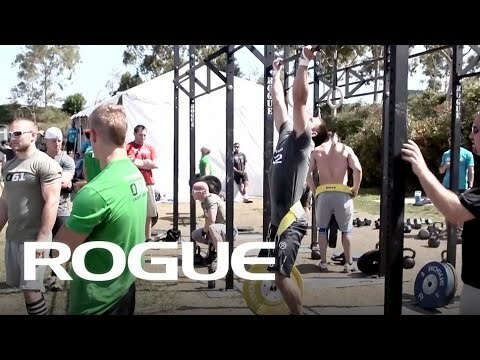 As seen in competition at the CrossFit Games, the Rogue Dip Belt is a key tool used to train gymnastics strength through a full range of motion. Whether you’re performing dips, pull-ups, or the hip belt squat, the 1/4” wide steel chain-link system and D-shaped carabiners on the Dip Belt allow for a higher load capacity, easy adjustments, and reliable safety under extreme tension. If you're looking to add a challenging new element to an existing body-weight exercise, this is the simple accessory to get it done. The Dip Belt comes equipped with a reinforced, comfort-fit nylon body with heavy stitching (available in black or yellow), a 30" total chain length, and a pair of straight-gate, locking carabiners. You can choose from black or yellow nylon, and both options include exclusive Rogue branding. Rogue Dip Belt is rated 4.8 out of 5 by 78. Rated 4 out of 5 by DAVE101 from Comparison w/ Spud Inc dip belt The belts are very similar at a similar price point, but for dipping/chinning 3 plates or more I prefer the Rogue Belt since the chain is a bit longer (see photo). My only gripe is the metal rings are almost too large, contributing significantly to the total length of the belt making it almost too big around the waist. (Waist is 34" at 5'10" 190 lbs). They have this belt at my gym and most people at my gym usually use the smaller leather one, but I'd wager anyone 200+ lbs would want to use this. For 45 lbs or less just pick up some chain at a hardware store and save $40. Rated 5 out of 5 by Yury77 from Solid belt! I bought this belt a few weeks ago, and I love it! It's very strong and handles heavy weights like they're nothing. I did weighted-dips today with 100lbs loaded onto the chain, and it felt great! There was no stretching or groaning of the fabric, like in a lesser-quality belt. This is by far the best dip belt I have ever used! Great job Rogue! Rated 4 out of 5 by Colt1979 from Good belt This dip belt is built like a tank. I've been using it for awhile now. I've had dip belts break on me in the past but this one seems indestructible. The nylon isn't quite as comfortable as other types I've used. But as far as built quality this is one of the best out there. You have to put 100lbs on it to even notice it. This belt is worth the money. Rated 5 out of 5 by Jamison from Ruggedly Reliable I bought this belt about a month ago to begin preparation for the pull up portion of a Marine Corp physical test. I looked at comparable leather belts, but few had comparably thick chains. Overall this belt handles 50lbs like it is nothing, and 100lbs like it is 50lbs (which--to this belt--is still nothing). Bulletproof dependability, the nylon is comfortable at heavy weights and high reps. Quality for years to come. Rated 5 out of 5 by GP NW from Overbuilt and black... so, perfect No-nonsense. All you will ever need in a belt. Worth it. Rated 5 out of 5 by Matthew516 from Quality I've used a lot of dip belts over the years for weighted dips, pull ups and walks. This belt is by far the best I've ever used. It really is comfortable and even during weighted walks the chain does not dig into my leg. Extremely happy with my purchase, as I am with everything I've ordered from Rogue. Rated 5 out of 5 by Stretch from Great Belt Bought this belt 6 years ago and has held up very well. Has been used with countless sets of dips and pull-ups up to 170 pounds without issue. I have a 34" waist and the belt hugs my waist fairly well and have rarely had an issue with the belt sliding down or digging into my hip or legs. As with any synthetic fibre belt, if you allow the fibres to fray then the belt may fail but I haven't had any issues with major fraying so far. The only thing that didn't hold up was the rogue logo which peeled off the belt as the fibres flexed over usage, which is no big deal. Overall very satisfied and would buy again. Rated 5 out of 5 by newbiewar from Perfect Size This belt is great, although they tell you that it's 3" wide, they never mention how long it is. I've used some belts that would fall off my hips while exercising. This one however is probably about 32", I can clasp that carabineraround both Rings with and do dips or pull ups. The width of the belt also distributes the weight well, well enough I intend to use this for belt squats. I do find it funny that this is called a dip belt, and the video and picture demonstrate pull ups rather than dips.